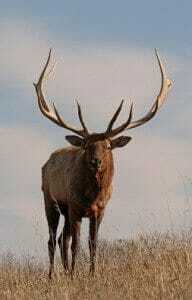 The Elk, or sometimes known as A wapiti, is one of the largest species in the deer family. Like all animals, Elks make sounds in order to communicate with each other. This elk sound is referred to as an elk bugle. Elk bugles are made for many reasons such as, an alarm or distress call, as a threat, for maternal reasons, social interaction, mating and much more. Bull elks make elk bugles that are much shorter in duration compared to the other elks. It bugles for about three to five seconds, but no less than three seconds. Elk bugles have many meanings that take a trained ear to recognize the key differences in tone, pitch and duration. Aggressive calls tend to have a lower pitch. For example, if an elk in the harem begins to stray too far from the rest of them, then the bull will call to that elk. They also call if an elk gets too close to the bull. Another part of elk bugles is an infrequent grunt that only happens in about 16% of elk bugles. To get the attention of another elk at a longer distance requires a long drawn out roar. It is a high pitched bugle followed by a string of grunts that are often referred to as a chuckle. This sound is projected over a distance of over hundreds of yards in open space. An agnostic call is made by the elk because it is displeased by the closeness of another elk. They like their personal space and will make it known if another elk is too close. This call is usually aggressive. This elk bugle is usually followed by a hissing sound as the approach to elk of problem. Bulls give off between one and four loud exhales that are called a cough when they are trying to get another elk to move away from them. If the elk does not move, the bull will kick or bite the other elk.